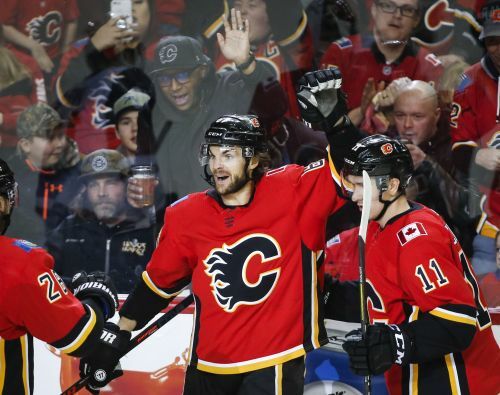 CALGARY, Alberta (AP) — Balanced scoring has helped the Calgary Flames snap out of a funk. Michael Frolik and Mikael Backlund each had a goal and an assist in the third period to help the Flames beat the Arizona Coyotes 5-2 on Monday. Mark Giordano also had a goal and an assist, and Derek Ryan and Austin Czarnik had the other goals for Calgary win its second straight to improve to 3-3-2 since the All-Star break. Czarnik and Ryan combined for a goal and three assists in Saturday's 5-4 win over Pittsburgh, which ended a four-game skid (0-2-2). "We've had some depth scoring come through, which is important," Flames coach Bill Peters said. Elias Lindholm assisted on both third-period goals, Rasmus Andersson also had two assists, and Mike Smith stopped 27 shots in his third straight start (2-0-1) for Calgary. "I feel more like myself in the net and it's paying off," Smith said. "It's a good time of year to be playing well." Czarnik got his second goal in two games after being a healthy scratch for the previous nine, giving the Flames a 3-2 lead with 3:42 left in the second. Subbing in on Calgary's third line again for the injured James Neal, Czarnik snared the puck on a broken play and scored from his knees with a low shot. "Feels great. Being out that long, it's hard to adjust right away. Your breath is a little short probably," Czarnik said. "To be able to do that builds confidence and I just want to keep that going if I can. "At the start of the year, I wasn't really finding those spots so I think now it's about getting more to the net and being in a spot to score goals." Frolik extended Calgary's lead to 4-2 at 5:48 of the third period off Arizona's defensive-zone turnover. Lindholm skated the puck out from the boards and dished to the Czech, who chipped the puck by Pickard stick-side. Backlund added an empty-netter with 1:12 left. "It seems liked any time we got momentum they got a goal right back," Coyotes coach Rick Tocchet said. "We've got to make some plays. We need some guys to step up and score goals. "It's only 3-2 at the start of the third. (There was) still plenty of time to get back in the game." Ryan opened the scoring as he deflected Giordano's slap shot up on Pickard at 1:34 of the first for his sixth of the season. The fourth-line center also won seven of 10 faceoffs to get the puck to linemates Andrew Mangiapane and Garnet Hathaway. "I thought they were really good again tonight. They've been good for a while now," Giordano said. "It seems like every shift they're in the offensive zone working the other team and grinding them. They're playing the right way, playing hard and getting rewarded." Garland beat Smith with a high backhand to tie it at 6:27 of the second. Giordano put Calgary up 2-1 with 8:40 left in the middle period. Instead of shooting from his preferred spot near the faceoff circle to the goalie's right, the Calgary captain went forehand to backhand to beat Pickard for his 13th. Weal, acquired from Philadelphia in January, got his first goal for the Coyotes on the power play with 5:39 left in the period. He took a cross-ice feed from Alex Galchenyuk and whipped a wrist shot past Smith's shoulder. NOTES: The Flames improved to 21-1-0 this season when leading after two periods. ... Flames D T.J. Brodie was scratched prior to the game and said to be day-to-day with an undisclosed injury, which promoted Andersson to Calgary's top pairing alongside Giordano. ... Neal missed a second straight game with an upper-body injury. ... The Coyotes have lost the teams' first three meetings this season. Arizona will host Calgary in the final matchup on March 7. ... Weal had just one assist in his first 15 games with the Coyotes. ... Garland has four goals in his last 10 games. Coyotes: At Edmonton on Tuesday night before closing out their western Canada swing Thursday night at Vancouver. Flames: Host the New York Islanders on Wednesday night.